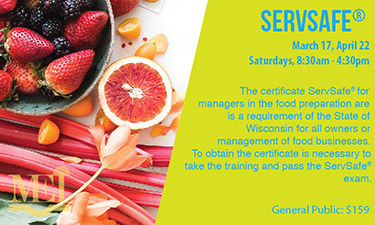 The certificate ServSafe® for managers in the food preparation area is a requirement of the State of Wisconsin for all owners or managers of food businesses. To obtain the certificate it is necessary to take the training and pass the ServSafe® exam. This semester we are not offering the class, instead we are offering the exam. Please call to know date, time and place of exam.